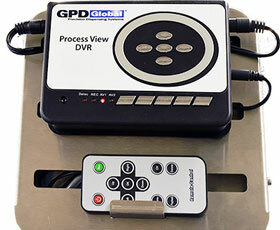 GPD Global's exclusive Process View Camera allows you to view your process live and display it on a large process view monitor. 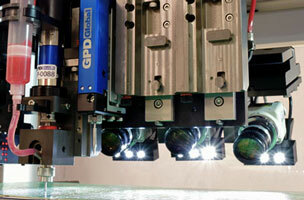 The color Process View Camera is especially useful when dispensing on today's shrinking components and other products requiring micro volume dispensing. View Your Applications Live - video. Operators can now monitor long-running processes from across the room. Imagine the time and resources saved by real time video of your dispense process allowing the operator to quickly make adjustments, as required, without having to remove the substrate for inspection. The Process View Camera is mounted behind the dispense station and focused on the dispense tip. When multiple dispense stations are used, multiple cameras can be used, positioning each camera to view one of the dispense tips. The Process View Camera display shows video for the active pump. Illumination is provided by adjustable LED lighting mounted to each camera. 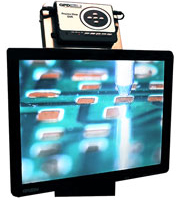 To view the camera image, a Process View Camera monitor is mounted on the side of a MAX Series or DS Series dispense system for easy viewing either while at the machine or from across the room. For presentation and process reporting, Process View Camera video may be saved with an optional video capture unit. Alternatively, the process image can be ported to the rear of the system to allow the user to define their monitor size and placement. 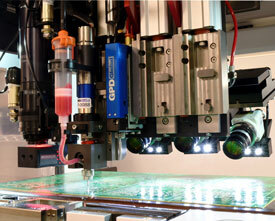 The optional Process View Recorder is used with the Process View Camera. The Process View Recorder is an easy-to-use digital video recorder. 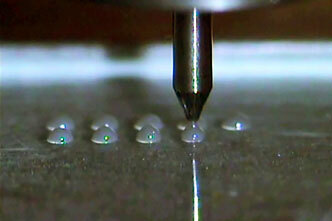 It allows recording of the process performed at station 1, 2, or 3 of a dispense system. Video from an active Process View Camera can be recorded and immediately viewed on the Process View Camera monitor. Video is stored on an SD card for transfer to an offline system for editing or viewing. The included 8GB SD card can hold tens of hours of videos. The Process View Recorder is easy to operate via the front panel or a remote control. Use of a date and time stamp on the recording is optional. You can choose to turn on/off the automatic overwrite function when storage is full. The Process View Recorder option includes Process View Recorder, Remote Control, 8GB SD card, and User Guide.